[08/20/2014] A brief introduction to my research and my group (GeoTECI lab at CCNY) with 9 slides is added. 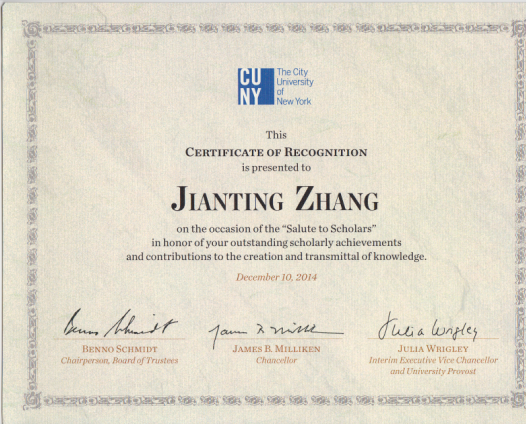 [12/10/2014] I was a recipient of the CUNY Certificate of Recognition for the year 2014. [03/11/2015] GeoTECI Ph.D. Student Simin You has released his SpatialSpark source code at GitHub [Link]. The related CloudDM'15 paper can be found here. [04/02/2015] A summary of our work on GPU-based geospatial processing over the past five years (2009-2014) entitled "Large-Scale Spatial Data Processing on GPUs and GPU-Accelerated Clusters" appeared at the ACM SIGSPATIAL Special as an invited paper. Click here for a local copy. [07/03/2015] We have released the source code of our ISP prototypes (including ISP-MC, ISP-MC+ and ISP-GPU). Click here for the code and here for the HardBD'15 paper as a high level documentation. It has been a very tough yet pleasant journey to learn advanced features of Impala and integrate our single node data parallel spatial indexing and spatial join techniques (on GPUs as well as multi-core CPUs) into Cloudera Impala. The learnt experiences and lessons lead us to the design and implementation of LDE as a succession to ISP. [12/29/2015] GeoTECI Ph.D. Student Simin You has successfully defended his dissertation on 11/30/2015 and completed all the procedures for graduation recently. The PDF file of Dr. You's dissertation, entitled "Large-scale spatial data management on modern parallel and distributed platforms", can be downloaded here (139 pages). Congratulations! [09/01/2016] Zuliang Zhao, a Ph.D. student from Chinese Agricultural University (CAU) joined GeoTECI Lab as a visiting student for two years. His visit is funded by China Scholarship Council (CSC). [11/11/2017] I have released a technical report entitled "Regularizing Irregularity: Bitmap-based and Portable Sparse Matrix Multiplication for Graph Data on GPUs", click here for PDF. It has been quiet a lot of fun to apply CUDA programming to a new discipline. [11/11/2017] I am offering a new graduate course at CCNY (course # CSc G0815) entitled "High-Performance Machine Learning: Systems and Applications" starting from Spring 2018 semester. Click here for syllabus in PDF.